The PortÃ©gÃ©Â® M400 packs powerhouse performance into a supremely portable package. Extended battery life* and an array of connectivity options keep you productive and get you connected while on the go. 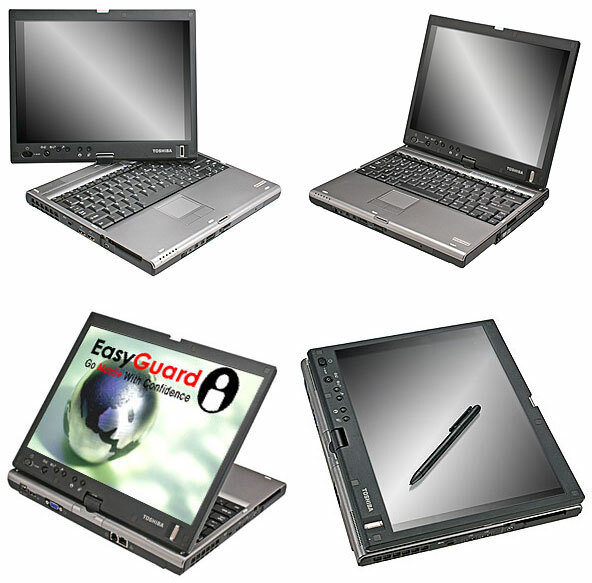 Mobile productivity goes even further with rigorously engineered Toshiba EasyGuardâ„¢ technology* designed for optimal reliability*, security*, connectivity* and optimization* â€”in any mobile setting. – More pictures at TabletPC Review Spot. – PC Magazine – Miller Blog – March 2006 – For carrying back and forth, Iâ€™d still give the nod to the X41 tablet, which at 3.5 pounds does feel significantly lighter. 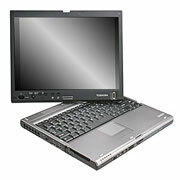 But the M400 is very nice â€“ and it offers the Core Duo possibility and that optical drive, which is very convenient. – Craig Pringle’s Hands On Review – February 2006 – Overall I am very pleased with the M400. The device is pleasant to look at and the design is very functional. Some of the value add software is excellent. Also â€“ and very importantly â€“ Toshiba clearly listened to itâ€™s customers when they griped about the brightness and viewing angle on the M200 because the problem is well and truly gone on the M400.